So you started a blog and now you want it to be successful… amirite? You could be a month in or 2 years in. It really doesn’t matter. 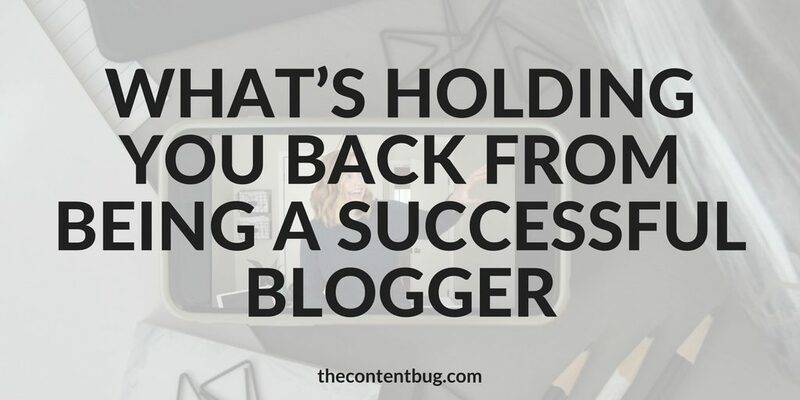 All that matters is that you’re here reading this blog post and ready to learn more about what’s holding you back from being a successful blogger. Here’s the thing. As bloggers, we go on Pinterest a lot. 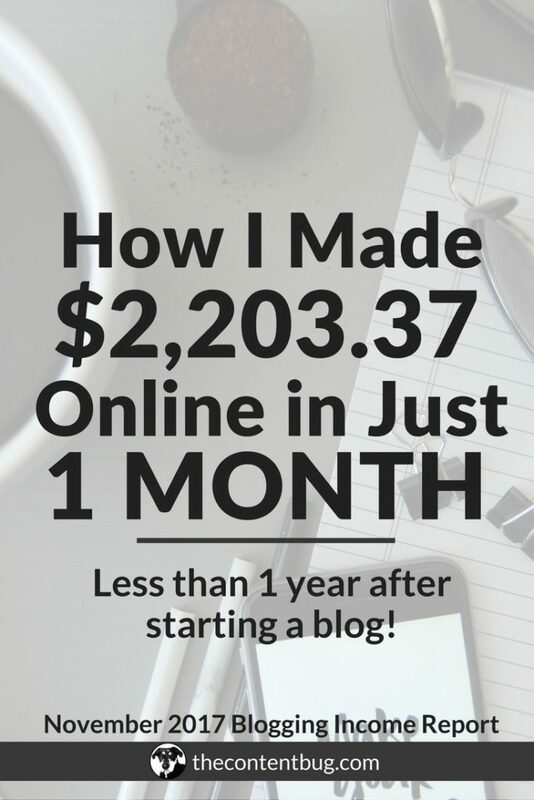 And while we’re there, we notice that there are a lot of bloggers sharing income reports about how they make 100k plus a month with their blog. And we sit here going: WHAT?! HOW?! So we read the post and learn that they made money from their online course or through affiliate income. And then we sit back thinking: Well that must be nice? Or maybe you try to read all of their blog posts to learn exactly how to do it and then you try to see how you can copy what they did. It really doesn’t matter how you react all that matters is that you are wasting your time trying to figure out how someone else became successful instead of working to make yourself successful. Oops. Did I just say that?! And you better get ready for some more tough love because this post is full of it. So go ahead and grab yourself a glass of wine or a cup of coffee, whatever you prefer, and keep reading! This is a tough question. And it might be something that you’ve asked yourself a time or two as you try to reach your own level of success. But it’s a pretty interesting question. And it’s not something that should be ignored in this blog post. Most of us bloggers think that money makes a blogger successful. Because as a blogger, money can be hard to come by. You have to work long and hard to earn your money. And if you want to make a passive income you have to work a lot smarter, not harder. And that’s okay. Because when you love what you do, it’s all worth it. But when happens when you become too concentrated on the amount of income you’re making? It may seem like you’re never making enough. Well, I made $1,000 this month… how can I make $3,000 next month? Okay well, this blogger is making $15,000 a month… what can I do to reach that level of success? Before you know it, you’ll be caught in a rat race trying to reach a certain monetary value of success. So before we really dive in, I want you to ask yourself one simple question: What would it mean to be a successful blogger? It could mean that you make a certain amount of money. Sure! That’s possible. But it could mean that you’re happy. Or that you’re changing lives. Or that you have an influence on over 1 million people that you get to help on a daily basis. Whatever it is, success is probably going to look different to you than it will to the next blogger. So really think about it. But before you just write down that being happy would make you successful because you think it’s the right thing to do, I want you to be really harsh on yourself. Harsh in a sense of honesty! 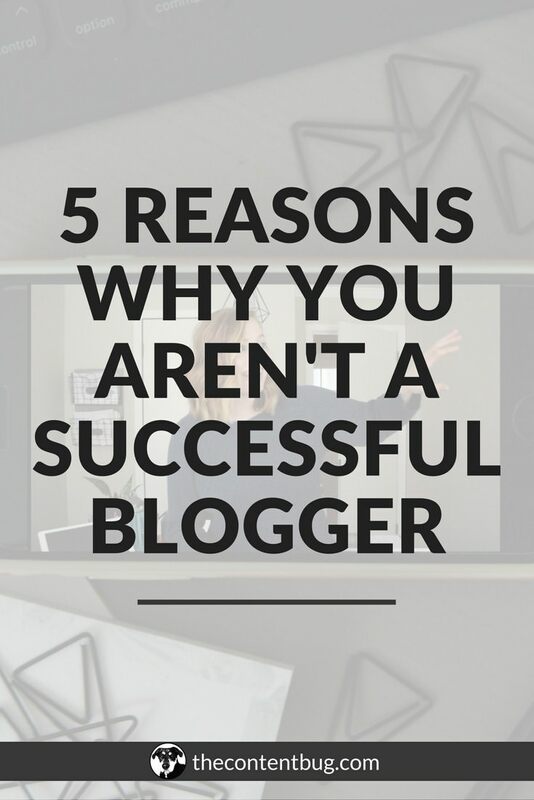 If success would really mean that you’re making enough money to be a full-time blogger, then freakin’ put that down! There is no point in lying because you’re the only one that’s going to see it. Now that we’ve got that covered, it’s time to get to the good stuff. If you’re reading this post, I’m going to guess that you think that you haven’t reached the level of success that you’re looking for. So you’re here for some advice on how to make yourself successful. Well, that information is in this post. But you have to get through the tough stuff first. So here are 5 things that might be holding you back from success. RELATED: Create Your Success Online: New blog and video series! When you started your blog did you read an article titled something like this: How to Start a Money Making Blog in Just 30 Minutes!? It’s okay to raise your hand. My hand is raised too. When I started my blog, I really didn’t do too much research. But one thing I did research was how to make money blogging. And I wanted to make money quick! Because there were several blogs that told me I could make a couple hundred bucks in a month. That was so far from true. And it took me a little while to actually make money on my blog. But for the first few months, I was so worried about making money that I didn’t actually make money. And you want to know why? Why Cath, WHY?! Well, while you’re so worried about making money, you’re not focusing on how to build an audience. Which is the basics of making money. We’ll talk about this in a little bit. So you gotta hold tight. But this happens to so many bloggers, it’s not even funny! When you’re focused on the money side of things, you lose focus on what’s important… your audience. Because without an audience, you can’t make any darn money! So instead of spending hours a week reading about how other bloggers are making money and refreshing your ad network page to see if you made another pretty penny, spend your time understanding, building, and connecting with your audience. You’ll see a better reward in the end. I promise. How often do you worry about how many people are following you on social media? And if 3 people unfollow you it’s like the world has ended! Or how about checking Google Analytics to see if you’ve gotten more people to your blog? — What?! Only 10 people viewed my blog post I published 3 hours ago! How is that possible?! I need to blast it on every social media channel possible so that people know that I posted something new! Do you see how ridiculous that sounds? I sure hope so. But here’s the kicker… that was me! When I first started my blog, I wanted to see the results. I wanted to know that people were landing on my website. And, of course, I wanted as many people to follow me on social media, even if they weren’t the right people. And when I worry so much about the numbers, I stopped focusing on the actual growth of my blog. Instead, I gained more followers on Instagram than I could have imagined. Only to realize it was a HUGE waste of my time. And now I have people wondering why my Instagram doesn’t grow like that anymore. Well… it’s because I’m focused on a more important level of success, mkay pumpkin? So yeah. Stop wasting your time focused on the numbers. Good ole Gary Vee always says to never focus on the numbers. To just keep doing what you’re doing until people notice how amazing you are. He did it for 7 (or so) years before anyone noticed. Now look how successful he is! So stop worrying about your numbers. It doesn’t matter how many people are following you or how many people visit your blog. Instead, worry about the quality of content you provide and the way you are building your reputation online. Those will come back and bring you real success when people start to notice. And trust me… they will start to notice! Yeah. That one was tough to type. But I had to say it! Honey, you might not be writing anything worth reading. And that’s exactly why you aren’t reaching the level of success that you’re looking for. Here’s the thing. We all think that what we have to say is important. And here’s another bit of tough love: sometimes, no one cares. And the more you realize that no one cares, the better blogger you’ll be. Because you’ll start to work harder to write blog posts that people will actually care about. Blog posts that people actually want to read. So yeah. Right now, your blog posts may be crap. Mine were too when I started out. But the more I honed in on my mission and my blogging purpose, I was able to start creating blog posts that people enjoyed! Blogs that are now shared over 4,000 times on Pinterest! And that’s a pretty cool thing to say. So here’s my recommendation to you, so that you don’t hate me after reading this section, focus on your audience and think about what they want to read. Then start writing it! If you’re struggling, start with talking out loud to yourself. The best blog posts sound like their just a friend talking to you. I swear I’m going to stop with these low blows soon! But this was something that I had to realize not too long ago. I wanted a certain level of success. I honestly wanted a certain amount of money. But I wasn’t working as hard as other people that were making that kind of money. So why did I think that I deserved it when I wasn’t willing to put in the work?! Wow. That was a real slap in the face when I realized that. But it was one of the most important slaps in the face that I’ve given to myself. As a blogger, it’s easy to get stuck in a rut. You write blog post after blog post. But that’s just not good enough! You need to work harder. You need to dream bigger. And you need to take a walk on the wild side and step outside of your comfort zone. Otherwise, you’re going to be stuck reading about other blogger’s success while you’re still sitting at your boring desk job. To be successful, you need to understand that there are going to be sacrifices. You’re going to have to say no to events. You might have to work late. And you sure as heck may eat more than half of your meals in front of your computer. But sometimes you have to do what you gotta do to be where you wanna be. I see a lot of bloggers get bummed out that they aren’t growing when I see that they spend at least 2 hours a day on Instagram. Or they spend 3 hours trying to take and edit the perfect selfie. Oh, my sweet sweet friend… that’s just not worth your time! “Done is better than perfect” has become my life motto. For so long I was a perfectionist. And I honestly thought it was a good thing. I thought it was a desirable trait! Boy, was I wrong! Because a perfectionist is a terrible thing. TERRIBLE! And if you can proudly say that you are a perfectionist, then it’s time for you to work hard to break the habit because you’ll never reach success with that mindset. Oh, my goodness. I swear I’m almost done with the harsh comments. What I’m trying to get at is that we all have the same amount of time in the day. And how you spend your time is critical. Time is, in fact, money! So if you want to reach success, then you need to start treating your time with respect and use it wisely. Otherwise, it will keep slipping you by and success will always be an arms distance away. Phew! You made it through that one. Are you okay? Any bumps or bruises on your pretty little ego? If so… GOOD! Now rub some more dirt on them and let’s get to the real work. Create a blogging mission and purpose and stick to it! Most bloggers fall off track because they lose sight of what they are working toward. You start with a great drive and in a few months, you ask yourself: What’s the point? So it’s important to know exactly “what the point” is! So you have a solid reason to pick up pieces and keep blogging. Take the time to create your blogging mission and purpose. And if you already have one laid out, I challenge you to ask yourself your mission and purpose again. Because these will change. And that’s okay. You just need to stay true to you at all times. And stay true to your current mission and purpose. Everything you do should align with this! From your Instagram posts to your email newsletters. They should all align with this mission. No matter what. Now that’s real success, my friend. So you already know what success looks like to you. 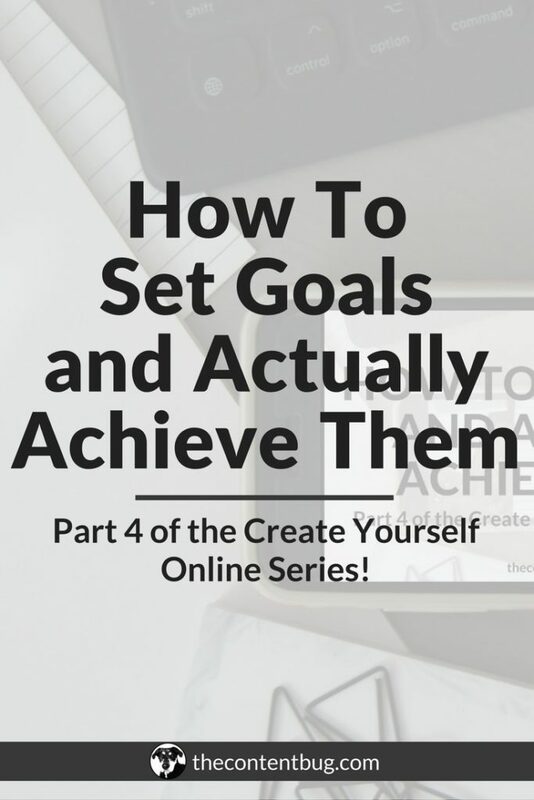 But do you have reasonable goals in place to achieve that level of success? If not… now is the time! Let’s get to work! Setting goals are what helps to keep you moving forward. Without goals, you really have nothing to work for. And what’s the fun in that?! We want to avoid you from spinning your wheels and wasting your time on unimportant things by focusing on the big picture of your blog. So set 3 to 5 goals for you to achieve in the next 90 days. Then lay out all the projects and tasks you need to achieve those goals. And then just do the work! 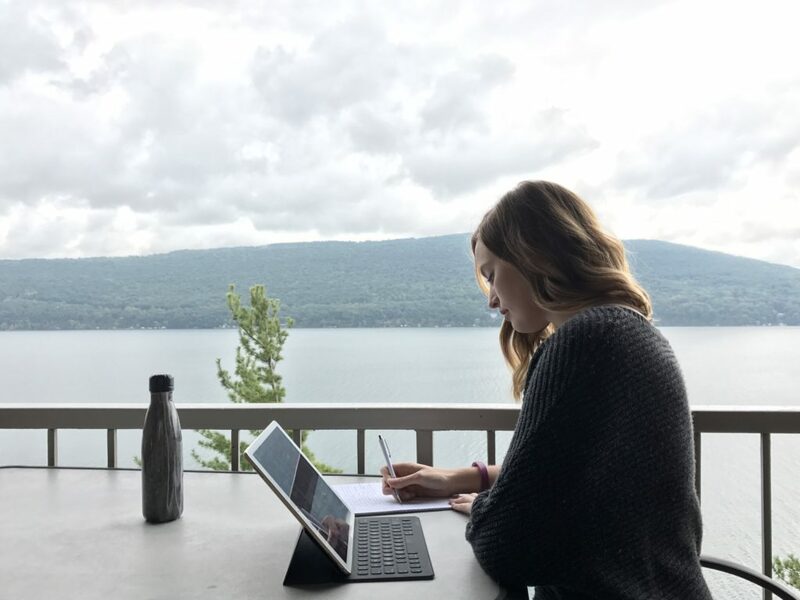 If you are running into the problem where you think you’re just spinning your wheels or that you wake up some mornings and you’re not sure what work you can do for your blog, then this tip is for you. Theming my days changed my life! And recently, I noticed that I’ve steered away from my set themes and things seem to be going crazy over here! So I’m back to theming my days for the New Year and I could not be happier! Let me explain. Do you notice that you’re days consist of you jumping from task to task? One moment you’re setting up meetings and the next you’re trying to write blog posts, email content, and social media content? What if I told you that jumping from task to task was actually making you less productive instead of more productive… oh yeah. It’s bad! It’s better to stick to one common theme for all of your work in a day. That way when you are done one task, you are already in the zone to complete another like-minded task. Every day I align my tasks so that I’m only working on tasks that align with my theme! Again… you need to trust me… but this really works! I notice that I’m more productive and I produce better work because of my daily themes. This is a great one to follow up theming your days. Have you ever thought about the value of your time? It’s pretty important. And really interesting to think about! Time is money, right? So why don’t we actually determine how much monetary value we are getting out of our time and start spending it more wisely? Read that again and again until it clicks. 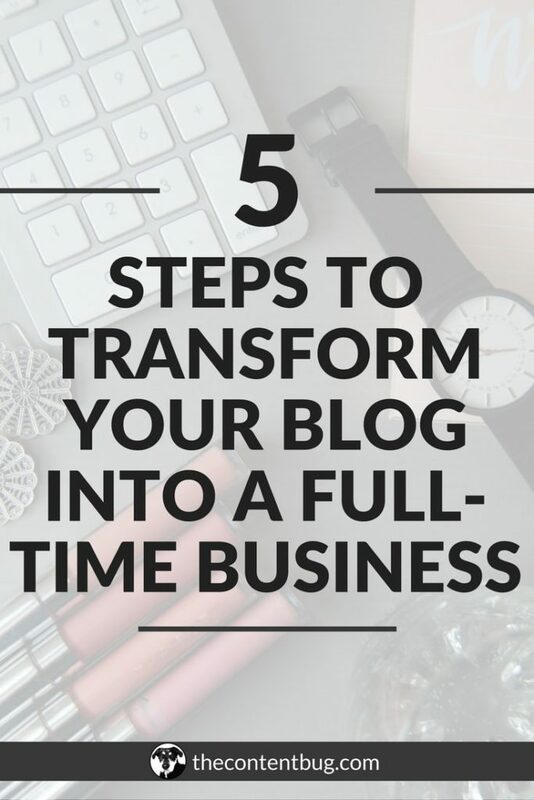 This was another game changer to help me transform into a successful blogger. Now I track the monetary value of all my actions. That way I notice if I’m only completing low-level tasks such as responding to emails and scheduling posts to social media. These are tasks that can be completed by anyone. It really doesn’t take much skill. And the more time I spend in these areas, the less money I’ll make in the long run. 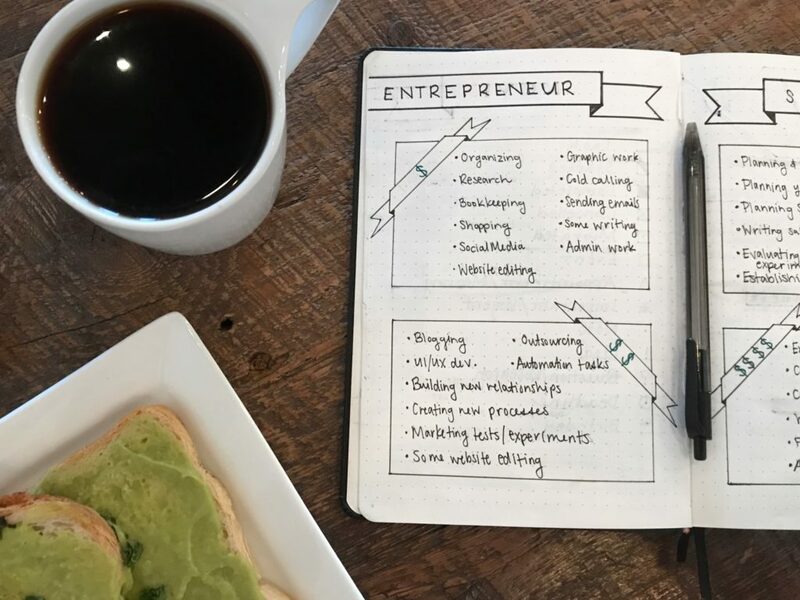 However, if I spent more time planning for the future of my blog and working on creating new products and finding a real way to make money, then I’ll actually notice a difference in the growth of my blog. And this is what I call a monetarily high value of my time because I’ll notice the reward with the growth my blog in about 90 days! So start thinking about how you spend your time and if you’re spending it wisely. And if it helps, place an actual amount of money to your time. I have 4 levels of my time: $10, $25, $150, and $500. Depending on the task, I charge it accordingly. And I like to see more than $450 in value for my time each day. I started blogging a year ago. And I’ve seen a lot of bloggers fall through the cracks and stop blogging along the way. Honestly, I think it’s sad! But blogging is tough. And if you don’t have the long game focus, then maybe blogging isn’t for you. But since you’ve read this whole post. And you’re ready to make a real blogging success story out of yourself, then here’s what I want to tell you. Don’t give up. EVER! Quitting is good for nothing. It will get you nowhere. And you’ll probably be stuck doing something that you hate for the rest of your life just because you didn’t want to get “uncomfortable”. One of my intentions for 2018 is to get comfortable being uncomfortable. So let’s do it together, okay? Let’s step outside of our comfort zones and do things that we never thought we could before. Let’s break the mold and create more successful blogs than those skeptics thought possible! Let’s make a real success for ourselves and create a community that’s unstoppable. I know you are going to kill it this year with your blog! Keep working hard and the hard work will pay off!